Come out to Big Screen Plaza for a special screening of the foreign film Bon Appetit. Bon Appétit, a film by David Pinillos, is a romantic comedy centered on two young cooks and a female sommelier working in a famous Zurich luxury restaurant. Bon Appétit was directed by David Pinillos, winner of the Goya Award for Best New Director. 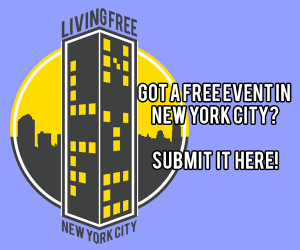 This screening is preceded by a special presentation by popular Spanish TV showman and comedian Andreu Buenafuente from the successful late night show “Buenafuente,” in collaboration with his production company, El Terrat. 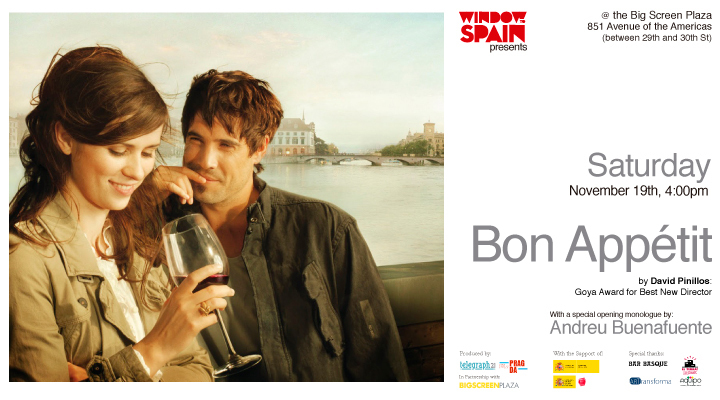 Window to Spain is a free 6-month summer cinema experience at the Big Screen Plaza in Chelsea, New York. Bringing a diverse selection of the best in Spanish contemporary art and film, Window to Spain turns this screen into a direct flight to Spain. Window to Spain is co-produced by Telegraph21 and Pragda. Screenings are shown in partnership with Big Screen Plaza and with the support of Spain’s Ministry of Culture and the Consulate General of Spain New York. We would like to give special thanks to El Terrat, ARTransforma, Bar Basque, and Aquipo. For more information, please visit, www.windowtospain.com.